Shortly before 5 a.m. on a recent November night, a garbage truck with a New York Yankees decal on the side sped through a red light on an empty street in the Bronx. The two workers aboard were running late. Before long, they would start getting calls from their boss. “Where are you on the route? Hurry up, it shouldn’t take this long.” Theirs was one of 133 garbage trucks owned by Action Carting, the largest waste company in New York City, which picks up the garbage and recycling from 16,700 businesses. In the universe of New York’s garbage industry, Action is considered a company that takes the high road. A union shop, it offers starting pay of about $16 per hour for helpers and $23 for drivers, far more than many other companies. And unlike some other companies, Action provides high-visibility gear and conducts safety meetings. But since 2008, the company’s trucks have killed five pedestrians or cyclists. In New York City overall, private sanitation trucks killed seven people in 2017. By contrast, city municipal sanitation trucks haven’t caused a fatality since 2014. Pedestrians aren’t the only casualties, and Action isn’t the only company involved in fatalities. Waste and recycling work is the fifth most fatal job in America — far more deadly than serving as a police officer or a firefighter. Loggers have the highest fatality rate, followed by fishing workers, aircraft pilots and roofers. 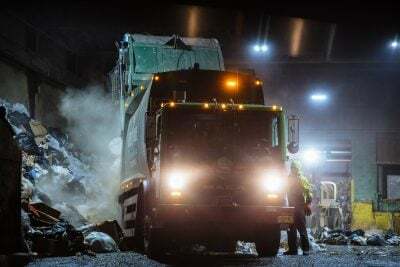 From the collection out on garbage trucks, to the processing at transfer stations and recycling centers, to the dumping at landfills, the waste industry averages about one worker fatality a week. Nationally, in 2016, 82 percent of waste-worker deaths occurred in the private sector. There are two vastly different worlds of garbage in New York City: day and night. By day, 7,200 uniformed municipal workers from the city’s Department of Sanitation go door-to-door, collecting the residential trash. Like postal workers, they tend to follow compact routes. They work eight-hour days with time-and-a-half for overtime and snow removal and double-time for Sundays. With a median base pay of $69,000 plus health care, a pension, almost four weeks of paid vacation and unlimited sick days, the Department of Sanitation workforce is overwhelmingly full time and unionized. It’s also 55 percent white, and 91 percent male. 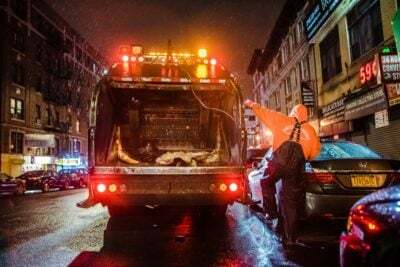 But come nightfall, an army of private garbage trucks from more than 250 sanitation companies zigzag across town in ad hoc fashion, carting away the trash and recycling from every business — every bodega, restaurant and office building in the five boroughs. Those private carters remove more than half of the city’s total waste. New York’s residential trash is hauled away by the city, but private companies collect trash thrown away by businesses, making hundreds of stops each. Follow one driver’s route. Since each business chooses its own carter, a dozen garbage trucks might converge on a single block over the course of a night. 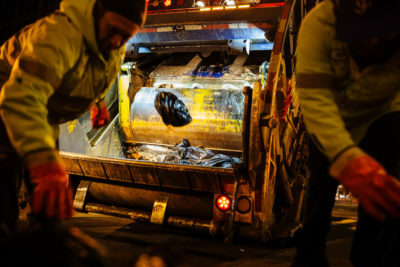 In one five-block stretch near Rockefeller Center, for example, 27 garbage companies stop at 86 businesses, according to an analysis of city data by ProPublica and the Investigative Fund at the Nation Institute. 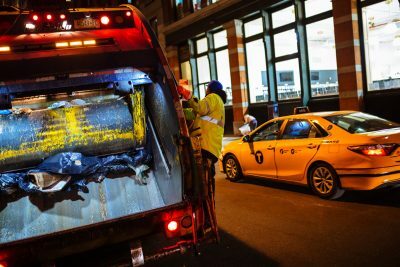 Plenty of other U.S. cities split trash collection along the same lines — residential waste on the municipal side, commercial waste on the private side — but New York is singular in the scale of private collection operations. Five Star Carting, the third biggest garbage company in New York City, with 10,400 customers, has received numerous citations from the New York State Department of Labor for underpayment or nonpayment of wages. In 2015, after two Five Star workers testified at a City Council hearing about their long hours, low pay and unsafe work conditions, they were fired. (They were later reinstated but only after labor advocates and City Council members organized a rally outside of Five Star’s headquarters.) Five Star declined to respond to detailed questions. 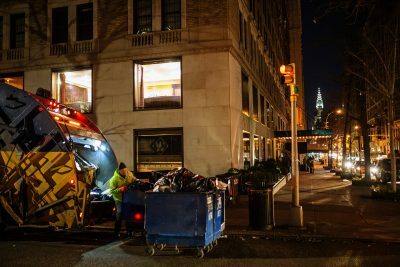 Private garbage trucks are ubiquitous on New York’s streets after dark, yet the human effort involved remains largely invisible to most people. To travel deep into the world of New York’s midnight trash collection is to enter a realm where people often toil in grave danger for low pay. Those perils are easy to miss in the roar of a diesel engine, the rush of a giant truck and a waft of scent from a bag we’re all happy to see somebody else remove. My first night following a garbage truck was on a sweltering Thursday in July 2016. After many rejections, I had persuaded a driver to let me follow him for a shift. He was taking a big chance: Workers can get fired in an instant, but he was willing to risk his job to take me into his world. What I saw opened the door to a far more complex investigation than I’d anticipated, one that involved dozens of interviews over 18 months with drivers, helpers, regulators, owners and experts; combing through thousands of pages of civil and criminal records; reviewing hundreds of documents obtained through public-records requests; and building a database of federal truck inspection records. That night in 2016, Alex Caban prepared for his shift as a garbage truck driver at #1 Waste and Recycler. New York was then in the middle of the city’s longest heat wave in 14 years. In his apartment above a deli in Crown Heights, Brooklyn, Caban dressed quickly in a black T-shirt, black Dickies and black leather work boots. Hot trash and its many leaky juices will soil anything lighter. Caban, a garbage man of three years, does not like to look dirty. Caban snacked on banana chips while he drove his minivan to the company yard, a gravel lot on an industrial stretch of Pacific Street in Brooklyn where freight trucks, buses and pit bulls are kept behind chain link fences. 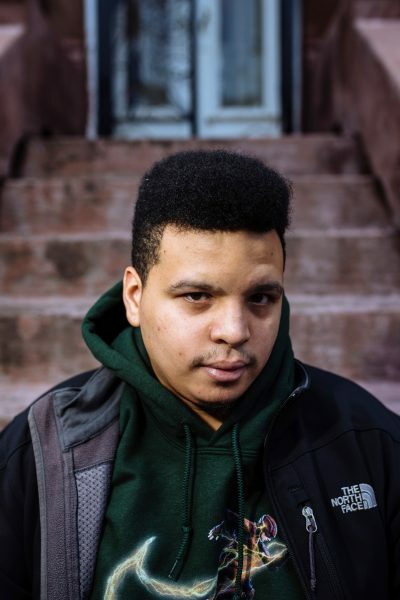 He prefers to drive to and from work so that when he heads home at the end of his shift soaked in what workers call “garbage juice,” he is not the person in the subway car that other riders move away from. “They think you’re a bum,” Caban explained, wrinkling his face for effect. An animated 45-year-old, Caban spoke in a Puerto Rican staccato, one thought tumbling excitedly into the next. He looked a decade younger with his wire-rimmed glasses, shaved head, and — when he wasn’t working — a button-down shirt and a brimmed hat. Caban arrived at the yard. Awaiting him was Bilal, 18, an immigrant from Yemen (he asked to be identified only by his first name). A “helper,” Bilal would spend much of the night riding the back “stepper” of Caban’s aging green garbage truck. Several lights were smashed in the rear, and the driver’s side door hung crookedly behind the cab, offering a view inside of ripped seats. Faded lettering on the side recorded the truck’s past lives. (“UNDER CONTRACT TOWN OF ISLIP”) showed it had once hauled trash in a Long Island town. (“PUT YOUR CANS IN OUR HANDS”) pointed to time in the recycling business. It was shortly after 6 p.m. on a night that could last past eight in the morning. Caban stepped up through the opening where the driver’s side door should have been. His helper, Bilal, rode shotgun. The engine growled, the throttle shaking the truck’s body, and with a blast of black exhaust, Caban pulled out and took a right on Classon Avenue, the broken driver’s side door flopping in the breeze. Rushing makes the job more dangerous, and most everyone has to rush in order to finish hundreds of stops — sometimes more than 1,000 — in a night, covering a route that could easily be 85 miles. 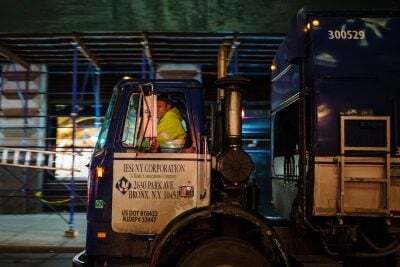 As most any private sanitation worker in New York City will tell you, the routes are often too long to finish within the 11-hour driving limit set by federal Department of Transportation regulations. As a result, many garbage truck drivers routinely drive far more than the 11-hour limit, hardly getting any time to rest before they must return to the wheel. It doesn’t help that many rigs are in terrible condition. 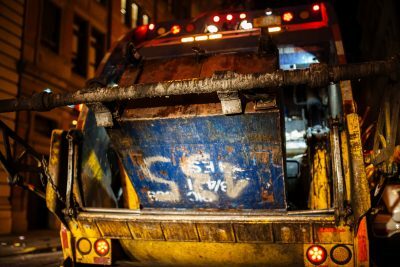 Garbage trucks from New York City’s 50 biggest companies are pulled off the road and declared unsafe to drive after 53 percent of government inspections, according to an analysis of data from the city and the Federal Motor Carrier Safety Administration. Fourteen of those 50 companies hadn’t been inspected even once in the past two years. Nationally, commercial trucks are pulled off the road after 21 percent of inspections. The industry doesn’t display a lot of urgency on safety issues. In October, garbage company owners, lobbyists and city officials held an event billed as a Safety Symposium, where industry participants seemed more eager to blame cyclists than take responsibility. “We’ve been talking about as an industry what we’ve been doing,” said Bill Falletta, safety manager of Action Carting, whose truck killed 27-year-old cyclist Neftaly Ramirez in the Greenpoint neighborhood of Brooklyn on July 22. “Is there anything being done to educate the bicyclists on safety? They should be following the same traffic rules that we do. I very rarely see that.” Later, when a city official explained that — although it was perhaps counterintuitive — narrower streets are actually safer because they slow the flow of traffic, David Biderman, an industry lobbyist, raised his hand and asked if narrower bike lanes could be used to slow down bicyclists. The consensus seemed to be that two-wheeled transportation was the real menace on the road. In real life, the need to move fast trumps traffic rules as often as not. On the July night I spent following Caban’s truck, it barreled past restaurant supply stores of Atlantic Avenue, made a right on Franklin Avenue, a left on Dean Street and another left on Kingston Avenue. Along the way, Caban and Bilal, his helper, sent bags sailing through the air from the curb into the street and from the street up into the truck’s back hopper. From Broccoli Farm to Superior Market, from Subway to Fulton Gourmet Deli, Caban made his way down the 500 stops on his route sheet, leaving a plume of hot garbage odor in the truck’s wake. Delis, liquor stores, laundromats, grocery stores, pharmacies, pizzerias, restaurants — Caban’s stops went from Crown Heights to Fort Greene and Bedford-Stuyvesant and Bushwick in Brooklyn, and then to the Lower East Side, Midtown, the Upper East Side, Harlem, East Harlem and Washington Heights in Manhattan. Setting up, as it’s called, is the foundation of successful — which is to say fast — driver-helper teamwork, and it requires both driver and helper to memorize the entire route sheet. The drill worked like this: Bilal jumped off the back stepper, raced ahead to a stop, and began to toss or drag garbage bags from the curb to the street. Caban, meanwhile, parked the truck to align its back hopper with the garbage and ran around back in time to help heave the bags from the street into the hopper. If a helper is skilled, like Bilal, and if there are multiple stops on a single stretch, he won’t wait for the driver but run ahead and continue setting up stops along the route. Tonight, Caban would often drive further ahead, get the stops with lighter bags himself and then circle back to get the set-up garbage. And if a helper is really, really fast, by the time Caban drives back the helper will have returned to where he started, and together the two can quickly make their way down the set-up stops. Helpers change from night to night, and having a good helper is the difference between Caban working 10 hours and 15. In Caban’s estimation, Bilal is “the number one helper” at #1 Waste. “He dazzles me every time,” said Caban. Bilal knows the art of the set-up and he knows the route; he knows when and where to sprint ahead. Theirs was a carefully choreographed routine, their faces set and focused, every motion swift and economical to shave off the seconds and the minutes. At a stop on Verona Place, Bilal threw bags over a parked silver Jeep, Caban catching one in mid-air and tossing it in the hopper, like a perfectly executed assist. At the Kennedy Fried Chicken on Marcus Garvey Boulevard, Bilal hopped off the back of the moving garbage truck, sprinted ahead to the curb, motioned back-up directions to Caban with a few quick flicks of the wrist. Caban then jumped out to get the bags while Bilal sprinted through traffic to the next stop. Caban then ran back into the truck and drove diagonally across the intersection to meet him. Repeat. “It’s a beautiful thing,” Caban said, and it was. Baby-faced, with a ready grin, Bilal looked young for his 18 years and barely weighed more than some of the bags he was lifting. He wore a blue and white striped polo shirt, and neither he nor Caban wore reflective vests — they said #1 Waste hadn’t provided any safety equipment. Workers say that’s common in the industry. Caban and Bilal purchased their own thin black cloth work gloves with traction on the fingers (about $15 for a pack of three, which might last a week or two). Cloth won’t protect against the glass that often protrudes through the garbage bags, but nobody wears thick leather safety gloves. The grip is bad and slows you down; you’re liable to lose your hold on the slick plastic bags and punch yourself in the face. Private carting companies have been part of the fabric of New York since the early 1900s. The carters handled trash in commercial areas, and municipal sanitation workers picked up the trash everywhere else, residential and business alike. That changed in 1957 when the city decided that commercial trash was too much trouble. Suddenly, all businesses had to pay for their trash collection. The Mafia quickly carved the city into territories. Under what was called the property-rights system, each stop was “owned” by a specified hauler. Attempting to underbid another carter was considered to be “stealing” his customer. Garbage haulers colluded, submitting uniformly high price estimates to a customer. Then the stop’s owner would offer a slightly lower estimate to win the contract — a practice better known as bid-rigging. In the early 1990s, Morgenthau’s office launched an undercover investigation of the industry. An NYPD agent posed as “cousin Danny” in a Brooklyn carting company, another posed as a building manager, and another as a Browning-Ferris Industries employee. Secret recordings confirmed the existence of the property-rights system and its control by mob members. The first of many rounds of indictments came down in 1995, and ultimately 72 defendants were charged: carting companies, owners, trade waste association leaders, the trade waste associations themselves, and the capos and soldiers they reported to. In 1996, the city passed Local Law 42, aimed at cracking the cartel, and created the licensing agency that is now known as the Business Integrity Commission to root out organized crime. The waste industry fought the reforms, but its suit against Local Law 42 was unsuccessful. The prosecutions brought down the cartel. Many leaders went to jail, had their assets seized and agreed to a lifetime ban, called a debarment, from the industry. Others were never prosecuted but still signed debarment agreements. Some people on BIC’s debarment list moved their companies out of town or sold them. But many on the debarment list simply handed their companies over to their wives or sons, who continued in the industry. Being related to someone on the debarment list is not grounds for the denial of a BIC license. (Haulers must be of “good character, honesty, and integrity.”) More than one person told me the sins of the father should not be imputed to the son … but you might want to want to take a close look at anyone related to past cartel members. To get a flavor of the sometimes dizzying ways in which families and entities intertwined, consider the Toscano family and its waste operations. In 1975, a company called TNT Carting was one of 55 haulers in New York that pleaded guilty to restraint of trade. TNT’s officers included Thomas J. Toscano and his brother Nicholas. Later Thomas J. Toscano founded Mr. T Carting. A nonagenarian, today he fills a more ceremonial role in the company (currently the fifth-largest hauler in New York), while his grandson Thomas N. Toscano is the company’s CFO. For all the upheaval, many cartel-era companies survived the transition. For example, Liberty Ashes, Mr. T Carting and New Style Waste Removal Corp (now Boro-Wide Recycling) were all members of the trade waste associations in the days of the cartel, according to lists recovered from the associations’ offices during the execution of search warrants in 1995. “You couldn’t do business in this industry without being members of those associations,” explained Thomas N. Toscano. “Yes, we were members. Yes, we paid dues. And the only time they ever went there was every three years when the union negotiation came up.” The Brooklyn association pleaded guilty to criminal restraint of trade in 1997, and the Queens association pleaded guilty to a criminal antitrust violation in 1998. In August 2016, the de Blasio administration released a study that recommended reining in the chaos of New York’s waste and recycling industry by dividing the city into zones. A company would make a bid to collect the garbage from all of the businesses in a given zone, and the city would pick the winner. According to the study, which was done by the Department of Sanitation and the BIC, zoning could reduce truck traffic by up to 68 percent and reduce greenhouse gas emissions by 64 percent, leading to “cleaner air” and “safer streets,” as well as improve recycling rates, customer service and worker safety. A handful of cities, including Seattle, San Jose and Los Angeles, have introduced zoning. The efforts in Seattle and San Jose have yielded improved recycling rates and higher wages; the changes in Los Angeles are still being implemented. Many blocks in New York are visited by numerous private carters in the course of a night. One high-traffic block is 32nd Street between 5th Avenue and Broadway in Manhattan’s Koreatown. From top: Waste Connections, 1:02 a.m; Crown Waste, 2:21 a.m.; Action Carting, 3:27 a.m.
Industry opposition notwithstanding, the de Blasio administration is pressing forward with its reform efforts. The Department of Sanitation has hired consultants who are developing a proposal for what zoning might look like in New York. The exact number of zones is to be determined — Los Angeles has 11, for example — but only one company would operate in each. That suggests most of the city’s 250 private carters would have no chance at winning a bid. Even as it stands, the smaller companies tend not to last long; bigger companies snap them up. The 20 biggest companies in New York currently generate 80 percent of the revenue, according to the 2016 study, with the other roughly 200 operators fighting over the rest. In Caban’s view, the old days were the golden era of garbage. If a man worked himself to the bone, he could earn enough to buy a house and a car and send a kid to college. Working the night shift at a garbage company in New York basically had all the perks of working the day shift at the Sanitation Department. Almost every garbage company in the city was in the same union, Teamsters Local 813, and every three years, the union would rent out the ballroom at the Sheraton Hotel so garbage men could ratify the contract, which achieved routine raises, triple-time pay for snow duty, as well as paid holidays, vacations and a pension. That changed after the sweeping prosecutions of the 1990s. The gates were opened for a flood of non-union companies, and citywide collective bargaining became a thing of the past. “They got the mob out. But the workers got screwed royally,” said Teamsters organizer Allan Henry. Powerful AFL-CIO-affiliated unions like the Laborers and the Teamsters were edged out of private garbage operators. They were replaced by “independent unions” that cut sweetheart deals with employers, locking employees into jobs with low wages and poor benefits. One example is a union called LIFE 890, which represents workers at major New York City garbage companies including Boro-Wide Recycling, Liberty Ashes and Five Star Carting. Workers at several LIFE 890 shops, meanwhile, have said they’ve either never heard of the union or rarely see its representatives. And to the extent that the union plays a role, it hardly seems like a champion for its workers’ wages. At Liberty Ashes, the LIFE 890 contract sets starting pay at $0.25 per hour above minimum wage in perpetuity. In a wage-related class action lawsuit filed against Five Star in 2014, LIFE’s representative submitted an affidavit that supported the company rather than the workers the union ostensibly represents. “Nino [Tristani] is very quick to respond to my emails and address the grievances,” the union rep said of Five Star’s cofounder, “and is open to discussing the best way to resolve the issue.” Five Star settled with 61 workers in 2016 for $400,000 without admitting liability; LIFE 890 members were excluded from the settlement because the union’s contract mandates arbitration for grievances. LIFE 890’s role is at issue in a current suit in Manhattan federal court, in which former Liberty Ashes workers are suing over unpaid overtime wages. The company argues that the plaintiffs lack legal standing to bring the case on the grounds that all pay disputes must be addressed in arbitration proceedings. As it happens, LIFE 890 added a mandatory arbitration clause to the Liberty Ashes contract in December 2016 — just weeks before the company submitted it as evidence — which lawyers for Liberty Ashes maintain should be applied retroactively. A federal judge expressed skepticism about that position. “It seems to me at least counterintuitive that an employer and current employees through their union would be able to negotiate away rights of former employees,” said the judge, Richard Sullivan, in a hearing in February 2017. Independent unions have helped lower wages across the industry. In 1985, a helper started out making $16 an hour. At #1 Waste in 2016, Caban — a driver — made less. The sun hadn’t even set, and Caban was already tired. On Sunday and Monday, Caban had a helper who didn’t know the route, so they were on the road for 14 1/2-hours each shift and didn’t finish up until 8:30 a.m. Six days a week on the nightshift made it hard for anybody to ever get enough sleep. Caban usually woke in the afternoon, and before long it was time to head back to the yard. On Saturday, his one day off, his body ached and he was too exhausted to leave his apartment. Days passed where Caban hardly talked to anyone outside of work. Caban raced down Marcy, west on DeKalb, and north on Bedford, following a circuitous route and running more red lights than one could count. As the hopper filled with bags spurting garbage juice, Bilal pulled a lever on the right side to “run a cycle,” bringing the blade down to grab the bags. Then he pulled it again to “send it up,” packing the garbage into the truck’s body. If there was one thing Caban was grateful for each night, it was that his route involved only garbage bags — no containers (what laypeople call dumpsters). When he had worked with containers at previous jobs at Viking Sanitation and La Vega Carting, he faced the constant fear of being crushed. 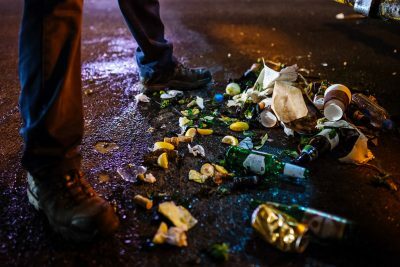 Wrestling a container into the back of a garbage truck is a precarious maneuver, and it can easily slip and fall on you — a common way to die or lose a limb in this industry, according to the New York Committee for Occupational Safety and Health. After three years on the job, Caban was marked from head to toe. He had a deep scar on his left leg (stitches after glass in a bag sliced open his calf). On his right leg, there was crosshatching below his kneecap (more glass), and below that another scar from the time he missed when jumping onto the back of a Viking Sanitation garbage truck as it hurriedly pulled away (a jump he might have landed had he not been so exhausted at 5 a.m.). Then there was the deep indent on the left side of his head “about four inches behind what used to be my hairline,” Caban explained: A winch once slipped off a Viking container and smashed open his skull. Perhaps the most gruesome injury was from November 2013, when another Viking worker moved a container at just the wrong moment, crushing his hand. That night, he lost the tip of his right index finger. After Marthone, I found three men who’d worked at Liberty Ashes who each lost a finger on the same garbage truck — Truck 11 — according to a review of workers compensation records and interviews with five workers. 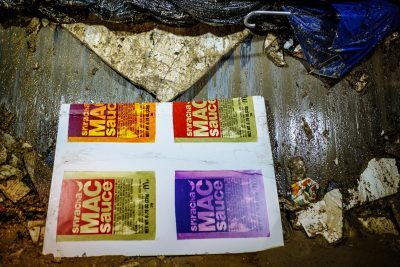 Several workers said the company had removed a safety latch in the back that would have locked in the container while it was being emptied. Liberty’s containers were too big to fit the latch, the workers said, so the company took it off instead of spending the money to buy new containers. The three amputations occurred between 2010 and 2016: First, Lenny Menna, a driver, severed a pinkie. Then came Luis Acevedo, a helper, who also severed a pinkie. A third worker lost his ring finger in early 2016. (Michael Bellino, Jr. of Liberty Ashes said, “I’m well aware of incidents that have happened with my company.”) Menna and Acevedo are plaintiffs in the wage and hours suit against the company. No New York City agency is directly responsible for waste worker health and safety. Instead, it’s a regulatory patchwork: The city’s Department of Sanitation oversees what’s done with the waste itself, the state’s Department of Environmental Conservation oversees the waste transfer stations, the state’s Department of Transportation inspects the trucks, and the city’s Business Integrity Commission handles licensing and background checks to determine that a company isn’t mobbed up. A missing safety latch can claim more than a finger. In 2014, a helper at Flag Container Services on Staten Island was crushed to death after a container slipped. His truck had no safety latch. OSHA fined the company $7,000, the maximum allowable by law. Workers at companies large and small told similar stories. At Queens County Carting, Ernesto Waight said he drove one truck where the shifter would suddenly jump into reverse, and another where a wheel rolled off on Astoria Boulevard in Queens. 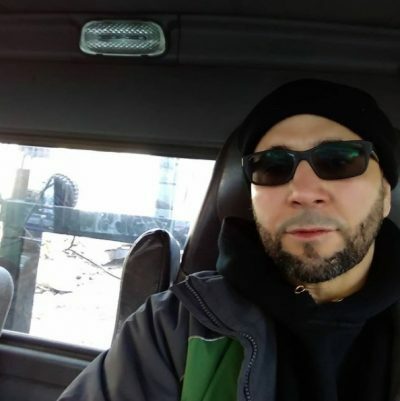 After Wilson Perez’s brakes failed exiting the Brooklyn Queens Expressway, he said, a supervisor told him to drive the truck back to the yard regardless. Carl Orlando said he drove one truck where the dashboard caught fire. Orlando recalled another shift, this one on a cold winter night, when the air line in his brakes froze. To stop the truck, he crashed it into a utility pole. Queens County’s owner, Bilik, disputes that his trucks were ever “anything less than safe,” adding “we have recently replaced almost our entire fleet.” And he denies that a driver would ever have been required to drive a truck he’d flagged for failing brakes. Queens County trucks were pulled off the road for being unsafe after 12 of the last 16 inspections, according to data from the Federal Motor Carrier Safety Administration. In 2007, LaPuma was among four defendants indicted in Queens for trying to take over another waste company by setting fire to garbage trucks, stealing 205 of their containers and threatening to kill the owner. LaPuma pleaded guilty to first-degree attempted falsifying of business records, a felony. He did not respond to requests for comment. At 7:30 p.m., Caban made his way south on Franklin Avenue in Bed-Stuy, reversing diagonally against traffic through the intersection at Lafayette Avenue to get the garbage from a deli across the street from Dough Donuts, then drove diagonally back into southbound traffic. Bilal perched on the stepper with his back pressed to the truck (hanging wide increases the odds of getting knocked off and run over, another common way to die, according to the National Council for Occupational Safety and Health). When the squeeze was tight with a parked car, Bilal swung gracefully from the back right stepper up into the truck’s hopper. With less experienced helpers, Caban taught them what they needed to know. “Place your back, your legs, and your arms like if you’re swinging a golf club,” he explained. Swinging a bag like a baseball bat will risk spraying garbage juice in your partner’s eyes or mouth. Hold the bag away from your body to avoid gashes from glass. For lighter bags, use a down-and-up-and-over torso twist-swing. For heavier ones, over 70 or 80 pounds, do a full 360-degree spin-and-drag move, not unlike an Olympic hammer throw, using the weight of the bag to gain momentum. At the Putnam Deli on the corner of Classon Avenue, Caban tossed bags into the hopper and then ran inside to get his first bottled water of the night. Caban, who is Muslim, chatted in Arabic with the proprietor while Nancy, the bodega cat, looked on. Arabic was one of several languages he taught himself in jail. For many men with a criminal record, private sanitation is one of the few jobs they can get. When Caban got out of jail, he began as a helper at Viking Sanitation, in south Brooklyn. His first night on the job, he showed up and hopped aboard the back stepper — no training at all, a common way to start in this industry. Other helpers showed Caban the ropes, and after two years of hanging off the back of a garbage truck, he passed the commercial driver’s license exam and road test, and received a license to drive vehicles that weigh more than 26,000 pounds. In making the leap from helper to driver, he went from $120 to $200 per night at Viking. At #1 Waste, he made $1,000 a week working six days a week, routinely driving more than 10 hours a night. 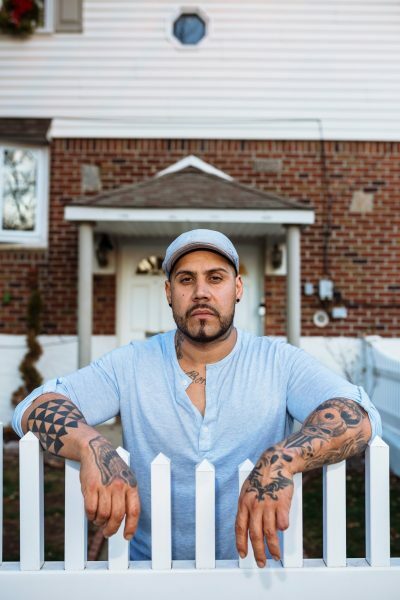 Caban’s dream was to work at New York City’s Department of Sanitation, but between his criminal record and the intense competition, he couldn’t believe that would ever happen. Picking up residential trash is one of the city’s most coveted municipal jobs. In 2015, more than 68,000 people took the sanitation civil service exam; it was the first time in eight years DSNY had offered the exam, and the department hires only about 500 people a year off the list. With seniority and overtime, experienced workers can make $90,000 or more annually. The job, which requires no college degree, offers a chance at a comfortable middle-class life, a five-day work week and the promise of upward mobility. Municipal sanitation work is still dangerous, to be sure, but workers undergo weeks of training, and the safety regulations are strict. In recent years, DSNY removed the back steppers from its entire fleet after pressure from the Teamsters. Carmona still hopes for a city job, but he has since achieved the next best thing: a spot at one of the top private companies. Carmona knew a guy who pulled some strings and got him hired by IESI, the second-largest waste hauler in New York City. It’s a Teamsters shop where starting pay for helpers is $22.40 an hour. The job was still backbreaking — it requires picking up far more tons per night than the day shift at the city — but IESI workers had a pension to look forward to. With overtime, a helper could pull in $70,000-$85,000; an experienced driver at IESI could make $80,000-$110,000 a year. And with that comes medical coverage, paid vacations and sick days. When he wasn’t on the back of an IESI truck — a behemoth outfitted with all the bells and whistles, like a back-up camera for the driver to monitor — he was dreaming of the vacation days he’d save up. Meanwhile, Eric Hyde, another Viking helper, had been cut from working three days a week, to two days, to one day — never knowing which day it’d be, making it nearly impossible to hold a second job. Hyde was now close to losing his apartment. On the Department of Sanitation hiring list, his number was 63,019. As the night wore on, Caban started treating red lights like stop signs: Slow down, look both ways, then go. A little before 9 p.m., Caban stopped at a deli on Pulaski Street, at the edge of Bushwick — a new stop his boss added to the route the night before with a short text message. Routes were always getting longer, but the nightly pay stayed the same. Caban made his way down Broadway in Brooklyn, then headed to Speedy Gas on Metropolitan Avenue to refuel. It was their first, brief rest after four breakneck hours. With his glasses atop his head, Caban played a phone game while Bilal put 62 gallons of diesel into the truck’s underbelly tank. Then Caban handed him a plastic bag and a rubber band. “Be sure to make it nice and tight,” Caban told him. “Strong—strong like bull.” Their truck had no gas cap. 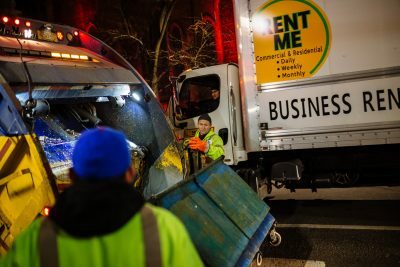 Shortly before 10 p.m., Caban headed to Hi-Tech Resource Recovery, one of New York’s 60 waste transfer stations (half of which are located in three black and Latino neighborhoods — north Brooklyn, the south Bronx and southeast Queens). Hi-Tech, which looks like a massive warehouse from the street, sits in an industrial but gentrifying area now known as East Williamsburg. From Hi-Tech, the garbage would get loaded onto long-haul trucks and carted to landfills and recycling centers hundreds of miles away. From there, Caban headed toward the Williamsburg Bridge. He would spend the second half of the night in Manhattan, picking up cardboard. Garbage and cardboard can’t (or rather, shouldn’t) mix in the truck. On other nights, the order was reversed: garbage stops in Manhattan then cardboard stops in Brooklyn. Learning the route meant memorizing which stops were which — garbage or cardboard — and on which days of the week, and how much to pick up (businesses pay by weight). A stop might be only cardboard on a Wednesday, or only garbage on Mondays and Thursdays, or only garbage on Tuesdays, or every day. How did he keep all the stops straight? “You learn. Trust me,” said Caban. “If you don’t learn, you don’t get to drive for them too often.” Businesses tend to complain about smelly trash left on their curb, or getting a ticket for a pile of cardboard that never got picked up. Caban stopped at a deli, a pizzeria and a grocery on Pitt Street just above Delancey Street on the Lower East Side. He carried a small packing knife with a retractable blade of about 2.5 inches, using it to slash through the cords of unwieldy bundles of cardboard, making the job go faster. Cardboard can be easier than garbage — at times it’s lighter — except when it isn’t. Some stops had 300-pound bales of cardboard, which Caban and Bilal had to lift together, bringing them from the pavement to a winch mounted onto the back of the truck. Tonight, luckily, it did not bash his head in. To stay awake the rest of the night, Caban followed his routine: coffee, Red Bull when it got bad and 5-Hour Energy when it got really bad. As the hours wore on, the streets grew quiet. That was another reason he kept the packing knife on him. One night they were stopped on a deserted Manhattan street, and three guys jumped Bilal and punched him, according to Caban. He came to Bilal’s rescue with his knife at the ready. Caban and Bilal made their way up First Avenue. On other nights he continued up to the top of Manhattan, to stops at 191st Street and St. Nicholas Avenue, but not tonight. Tonight, the two men picked up cardboard from the Crown Fried Chicken on 163rd Street and Amsterdam Avenue, then headed west to Broadway and south. A fish market, a pizzeria, a deli, Boost Mobile, another Crown Fried Chicken — toward Second Avenue and then all the way back downtown. When Caban passed other garbage trucks, they honked their horns in salute. “We know we down in this shithole together,” he said. The stops became a blur. By the end of the night, when Caban did stop for red lights, he fell asleep at the wheel. A little before 4:30 a.m., he parked the truck back at the yard. Pacific Street was desolate. Caban and Bilal had made good time, finishing the route in about 10 1/2 hours. Still, Caban was exhausted. Driving back to his apartment, he passed the hulking armory building on Pacific Street, a homeless men’s shelter dubbed Grayskull Castle. He had lived there after getting out of jail. After he got the job at Viking Sanitation and got a place of his own, each injury that put him out of work left him feeling one step closer to Grayskull Castle. He got home and took a shower. The next night he would do the same thing again. July turned into August 2016, and Caban’s garbage bags grew heavier and juicier. In the summertime, New Yorkers go out more and spend more money, making more garbage for workers to lift off the street. On a summer night, a truck might pick up five or 10 more tons than it would in the winter. The next time I checked in with Caban in late summer, he told me he was too tired to talk. Eventually, Caban and I lost touch. This fall, I learned that he is incarcerated. On the Sunday after Thanksgiving, I took the Q100 bus to Rikers Island to find out what had transpired in the year since. The bus pulled up to the front building, the planes of LaGuardia Airport visible just across the water. The passengers — almost entirely women and children on their way to visiting hours — got off. There was space set aside near the entrance to park strollers. Alex Caban entered the large gymnasium that served as a visiting hall and took a seat across the table from me. To my right, an inmate in a gray jumpsuit smiled down at a toddler in his arms. The wall to the left was a big Sesame Street mural: Bert and Ernie waved while Grover flew above in the sky holding aloft the New York City Department of Correction shield. Caban recounted the events that led him to Rikers. I committed what I could to memory; a guard had instructed me to put my notebook and phone in a locker. Caban said his trouble began in August 2016, when he got a call about an opportunity to earn more money at another carting company. “I never should have left #1 Waste,” he said. Caban was arrested but got out on bail. He then bounced around working at different garbage companies. He had a short stint back at #1 Waste, but then one night while driving a truck that he said was missing a side mirror, he backed into a woman’s new Volkswagen. His career at #1 Waste was soon over. In the spring, Caban landed at a company called Yankel’s. He began driving a roll-off truck — the kind that typically carries a 10- to 40-cubic yard dumpster that “rolls off” onto the ground. Whereas before Caban heaved garbage by hand, now the machinery of the well-maintained Yankel’s truck did the lifting. Plus, it was a day shift job with a proper weekend: The owners were observant Jews, and all work came to a halt before sundown on Fridays. Caban posted photos online of himself at the wheel, happy to finally be driving a truck that other men would call pretty. “This truck smells like new car!” he told friends. But soon it was time to head to court again. He pleaded guilty to a third-degree misdemeanor assault and was sentenced to a year in jail, which he began serving in June 2017. Inmates at the Eric M. Taylor Center, where Caban was incarcerated, often do the trash pick-up for the ten jails on Rikers Island. But Caban said he was working in a bakery, where he likely earns less than 50 cents an hour. For once, he told me, he has enough time to sleep, exercise, pray and read books, most recently “Lies My Teacher Told Me,” a critique of the Eurocentric history taught to schoolchildren. Caban told me that Bilal, his helper from the summer before, is now working as a driver for #1 Waste. Caban looked forward to his release in 2018. He said he might take some garbage shifts to save up money, but ultimately he wanted to move on up in the world of commercial trucking: getting a Class A license. He wanted to drive a car-transport tractor-trailer or perhaps a big rig. Or maybe he and some friends would buy some property to fix up and start a business of their own. His career as a garbage man, he hoped, was coming to an end.